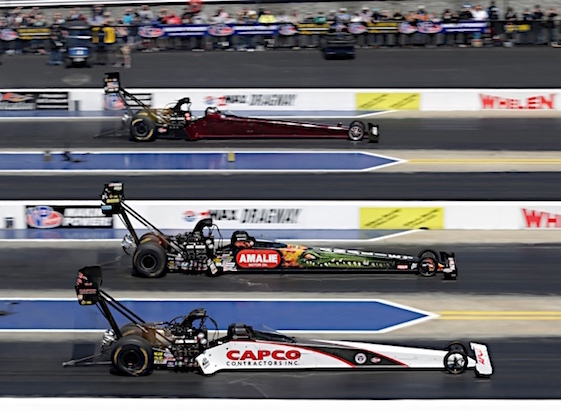 Racin’ Today » Torrence Tops Top Fuelers In N.C.
Torrence Tops Top Fuelers In N.C.
Steve Torrence drove to victory in the Top Fuel portion of Sunday’s NHRA Four Wide Nationals at zMAX Dragway in Concord, N.C. Joining Torrence as winners were Cruz Pedregon (Funny Car), Erica Enders (Pro Stock) and Jerry Savoie (Pro Stock Motorcycle). Torrence drove to a 3.813-second pass at 326.56 mph as he became the first driver to reach three victories on the season. He defeated Doug Kalitta, Terry McMillen and Clay Millican in the final round for his 19th career win and second at zMAX Dragway. 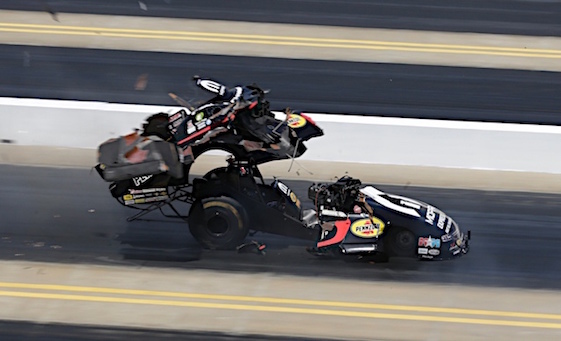 With the victory, Torrence moves back into sole possession of the Top Fuel points lead after entering Charlotte in a first-place tie with Tony Schumacher, who was eliminated in the first round. Pedregon ran a 4.059 at 310.84 in his Toyota Camry for his 36th career victory and first since Englishtown 2014. After qualifying sixth for the event, he was able to knock off 16-time Funny Car world champion John Force, Tommy Johnson Jr. and No. 1 qualifier Courtney Force in the final round to earn the victory. This was Pedregon’s 36th career Funny Car win, moving him past the legendary Don Prudhomme into sole possession of fifth place for all-time in Funny Car victories. In Pro Stock, Enders picked up her 23rd career victory and second win in Charlotte with a 6.535 at 212.73 in her Elite Motorsports Chevrolet Camaro. She took down Vincent Nobile, Chris McGaha and No. 1 qualifier Drew Skillman in the final round to lock down her first victory since Epping in 2017. Jerry Savoie emerged victorious in the Pro Stock Motorcycle class, as he earned his ninth career victory and first in Concord when he ran a 6.784 at 195.73 on his White Alligator Racing Suzuki in the final round. He bested Andrew Hines, Scotty Pollacheck and Matt Smith in the final round to lock down his first victory since Brainerd last season. The 2018 NHRA Mello Yello Drag Racing Series season continues with the NHRA Southern Nationals Powered by Mello Yello at Atlanta Dragway in Atlanta, Georgia from May 4-6. Final finish order (1-16) for professional categories at the ninth annual NGK Spark Plugs NHRA Four-Wide Nationals at zMax Dragway. The race is the sixth of 24 events in the NHRA Mello Yello Drag Racing Series. 1. Steve Torrence; 2. Doug Kalitta; 3. Terry McMillen; 4. Clay Millican; 5. Dom Lagana; 6. Shawn Reed; 7. Mike Salinas; 8. Audrey Worm; 9. Brittany Force; 10. Tony Schumacher; 11. Antron Brown; 12. Kyle Wurtzel; 13. Leah Pritchett; 14. Scott Palmer; 15. Richie Crampton; 16. Pat Dakin. 1. Cruz Pedregon; 2. John Force; 3. Tommy Johnson Jr.; 4. Courtney Force; 5. J.R. Todd; 6. Robert Hight; 7. Jack Beckman; 8. Ron Capps; 9. John Smith; 10. Bob Tasca III; 11. Tim Wilkerson; 12. Dale Creasy Jr.; 13. Jim Campbell; 14. Matt Hagan; 15. Jonnie Lindberg; 16. Shawn Langdon. 1. Erica Enders; 2. Vincent Nobile; 3. Chris McGaha; 4. Drew Skillman; 5. Jeg Coughlin; 6. Bo Butner; 7. Alex Laughlin; 8. Tanner Gray; 9. Jason Line; 10. Greg Anderson; 11. John Gaydosh Jr; 12. Alan Prusiensky; 13. Val Smeland; 14. Deric Kramer; 15. Matt Hartford; 16. Kenny Delco. 1. Jerry Savoie; 2. Andrew Hines; 3. Scotty Pollacheck; 4. Matt Smith; 5. LE Tonglet; 6. Ryan Oehler; 7. Cory Reed; 8. Angelle Sampey; 9. Angie Smith; 10. Karen Stoffer; 11. Joey Gladstone; 12. Jim Underdahl; 13. Eddie Krawiec; 14. Steve Johnson; 15. Hector Arana Jr; 16. Hector Arana. Top Alcohol Dragster — Megan Meyer, 5.192, 276.29 def. Dan Page, 5.250, 276.97. Top Alcohol Funny Car — Annie Whiteley, Chevy Camaro, 5.467, 267.59 def. DJ Cox Jr., Camaro, 6.296, 177.77. Competition Eliminator — Frank Aragona, Dragster, 7.378, 172.83 def. Al Ackerman, Dragster, 7.983, 151.39. Super Stock — Anthony Bertozzi, Pontiac Grand Am, 9.411, 110.71 def. Bryan Worner, Chevrolet, Foul – Red Light. Stock Eliminator — Thomas Fletcher, Chevy Camaro, 10.228, 117.67 def. James Williamson, Camaro, 11.485, 113.49. Super Comp — Jonathan Anderson, Dragster, 8.891, 162.78 def. Sherman Adcock, Dragster, 8.880, 166.91. Super Gas — Ken Griffiths, Chevy Corvette, 9.884, 152.68 def. Steve Furr, Chevy Camaro, Foul – Red Light. Factory Stock Showdown — Arthur Kohn, Chevy Camaro, 8.087, 168.56 def. David Barton, Chevy Camaro, 8.036, 167.84. Top Dragster presented by RacingRVs.com — Holden Laris, Dragster, 6.235, 208.71 def. Larry Roberts, Dragster, 6.104, 221.13. Top Sportsman presented by RacingRVs.com — Don O’Neal, Chevrolet, 6.903, 193.29 def. Sandy Wilkins, Chevy Camaro, 6.627, 208.14. FINAL — Torrence, 3.813, 326.56 def. Kalitta, 4.010, 278.12, McMillen, 4.361, 235.72 and Millican, 5.295, 129.97. FINAL — Pedregon, 4.059, 310.84 def. J. Force, 4.098, 307.93, Johnson Jr., 4.143, 275.39 and C. Force, 6.215, 114.46. FINAL — Enders, 6.535, 212.73 def. Nobile, 6.520, 212.69, McGaha, 8.237, 118.82 and Skillman, 18.515, 43.69. FINAL — Savoie, 6.784, 195.73 def. Hines, 6.873, 197.05, Pollacheck, 6.865, 193.79 and M. Smith, DQ. 1. Steve Torrence, 503; 2. Tony Schumacher, 426; 3. Doug Kalitta, 401; 4. Clay Millican, 384; 5. Antron Brown, 362; 6. Leah Pritchett, 315; 7. Brittany Force, 311; 8. Terry McMillen, 305; 9. Richie Crampton, 263; 10. Scott Palmer, 249. 1. Jack Beckman, 466; 2. Courtney Force, 425; 3. J.R. Todd, 403; 4. Matt Hagan, 395; 5. Robert Hight, 381; 6. Tommy Johnson Jr., 376; 7. Ron Capps, 352; 8. Cruz Pedregon, 274; 9. Shawn Langdon, 269; 10. Jonnie Lindberg, 256. 1. Bo Butner, 434; 2. Vincent Nobile, 417; 3. Erica Enders, 406; 4. Chris McGaha, 403; 5. Greg Anderson, 377; 6. Drew Skillman, 362; 7. Deric Kramer, 359; 8. Tanner Gray, 340; 9. Jason Line, 335; 10. Alex Laughlin, 316. 1. Andrew Hines, 204; 2. Eddie Krawiec, 166; 3. Scotty Pollacheck, 154; 4. Jerry Savoie, 148; 5. Cory Reed, 107; 6. (tie) Hector Arana, 105; Angelle Sampey, 105; 8. LE Tonglet, 95; 9. Steve Johnson, 88; 10. (tie) Ryan Oehler, 83.